Changing the IMEI (International Mobile Equipment Identity) and device id of any android device is really not a good idea because there are many advantage or disadvantage but sometime it help us to take some extra benefit from our device. Where the IMEI is used to trace the location of a device or find the stolen device, on the other hand its used to make a device untraceable by changing its IMEI number, serial number, device id, Donkeyguard number, UDID. You can also convert/change your Android IMEI to Blackberry (BB) IMEI by which you can use GLO BIS on it. 1. Change Device ID and IMEI of BlueStacks. 5. Getting an Unique device ID. 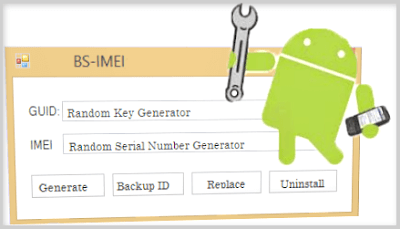 Universal method or the full procedure to change/rewrite IMEI number of an Android device(includes tablet) with or without root your device or with or without the use of any IMEI Changer Software, IMEI Change Tool, Terminal Emulator programmatically . To find out IMEI number of your device, just dial *#06# . To find out device ID, Just dial *#*#8255#*#* and you will get your device id in GTalk Service Monitor. And an another way to find out device id is by going to Menu > Settings > About Phone > Status. 1. First Dial *#7465625# or *#*#3646633#*#* on your android device. 4. Then, checkout for Radio information. 5. Now, if your android device is a dual sim device. Then you will get two option like IMEI_1 [SIM1] and IMEI_2 [SIM2]. Then select any one or of which you want to change IMEI number. Note: You can also change IMEI number to any Blackberry [BB] IMEI number. 3. Now, follow the wizard of this app. 4. And after changing the device id, restart/reboot your device and done. 2. Go to Settings. and then click on Backup & Reset. 3. Then, click on ‘Factory Data Reset‘. 4. And, then reset you phone. 5. When, reset done. Then you will get a new and unique device ID. Now:- This will wipe your all data like messages, phone memory, contacts, apps. So, you must have to backup your device and after that you can restore it. Xposed Framework, Donkey Guard App, HideMyRoot App, RootCloak App, IMEI Changer App. Also Read How to Download All/Multiple images from a website at once?